In my blog posts I often give updates on what my company is working on, and things I’m doing to try and grow it. It might seem like starting an animation company is easy, so I wanted to share with you the challenges I face. You might ask why building a brand is important, but as a service company it is very important. Making animation is extremely expensive, and for my clients is a huge investment. They want to make sure they can trust the company they are investing in to create their commercial, web series, or other animated video. This has been a huge challenge for me, because I don’t have much of a reputation yet. I have talked to a lot of other owners of animation or VFX companies, and many of them said it took awhile(around 10 years) before they started getting steady work. I’m sure some of this had to do with them figuring out their business and target market, but they tell me a huge part was simply building their brand’s reputation. Sure they might have had enough smaller projects to keep the lights on, but it took awhile until the bigger opportunities started to reveal themselves. As you might have guessed there is a lot of competition in this space. I’m competing against well established companies who are in a much better position to win jobs. They already have their feet firmly through the doors of the bigger clients. The other competition is from companies outside the US. First, there is Canada with their amazing tax credits, and then you have areas like India, Korea, China, and South America to name a few with much less expensive labor costs. The talent there is also getting better and better all the time. I often get emails from foreign companies offering their animation and VFX services if I want to outsource any of my work to them. I always ask them for what their rates are to see how they compare to US rates. If I tried to match their rates with US workers I would not only not be able to pay the artists what they are asking for, but also not be making any kind of a profit. This might seem odd to anyone who is not in animation, but this is a big hurdle for me. For those of you who don’t know what rendering is it is the process of the computer figuring out what each pixel will look like to create an image based on the settings you put into the software. It calculates the models, where the camera is, what kind of lens, how many lights, where they are coming from, their color, intensity, how they interact with the different materials on the objects in frame, and many other things. For a more detailed explanation go here. This requires very powerful processors to figure all of this out. I remember when I was in college, and working on my animation project ChessMate(see image below). I would work on the project late at night, and before I left I would setup 5 or more computers to work on rendering my project. I would leave signs begging people not to touch the computers. After rendering all night I would come back in the morning to check on them. I did this every night for months until I finally finished. It would take over 16 hours to render one 2 second shot, and often there would be errors requiring me to start the whole process over again. Computers are now faster, but the graphics are much more intense. 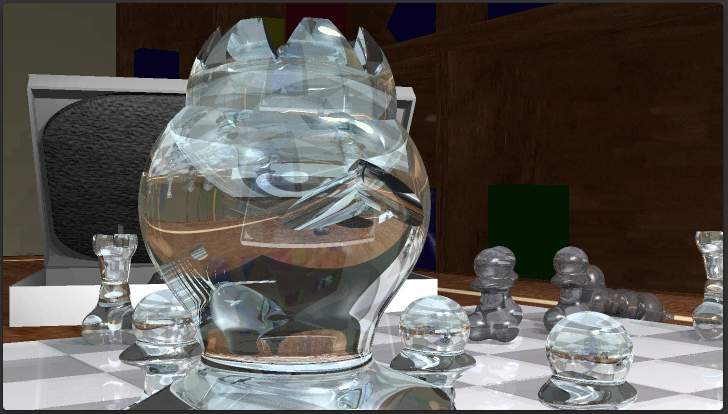 We also now render in HD at resolutions of 1920 x 1080 if not much higher, and ChessMate was only 728 x 414. I’m getting a little off topic, but my point is it takes a lot of computer power and/or time to render animation. So far what I have been doing is having the lighting artist handle the rendering. This should work for small projects, but as I get more clients I will need to figure out other options. There are online render services, but they can get very expensive. The other challenging part is you don’t know how long something will take to render until you can do test renders. This makes it extremely difficult to bid out a project for a client when there is a big unknown of how much your render costs are going to be. One frame might take a few hours to render, or it might take a few weeks to render. Your 5 minute animation will have 9,000 frames, so you can see how those costs could add up very quickly. If you want to try and control those costs a bit more then you are going to have to build your own render farm. Now you are buying thousands of dollars worth of hardware which will be outdated, lets be honest, as soon as you buy it. Not to mention you are going to have to have enough space to keep all this hardware. Have you seen pictures of Pixar’s render farm? Here is an image I found online. Now you know all about the rendering challenges, so what will you do with all these images these computers are creating? One of the 3 second shots for the client project I’m working on is 12GB, and this could have been a lot larger. Not to mention all the files needed to create these projects. Anything from photoshop documents, Maya files, Final Cut files, and all the other files needed to make these projects before we even start rendering. With a remote team I also have to have a way to transfer these files between the different people on the team. I have been using Dropbox, but I’m quickly outgrowing this. I had to get a Dropbox Pro which gives me 1TB(1,000 GB) of storage, but found each member of the team who is synced to the project folder also has to have this much storage space. I need to find a better option, but regardless of what option I go with it is going to be another costly expense. Currently I’m the only full time staff at the company, and everyone else is freelance who is hired based on the work we have. This works well to keep costs down, but it makes it difficult to build a company. It is challenging to line up project schedules with freelancers. You might have a great artist for a project, but you might have to find someone else for your next project because the last one is unavailable. Freelancers also provide their own workstations and software which can be a good thing, but can also cause issues. For example one of your artists might be using Maya 2014, and another is using Maya 2016. Now you have the issue where they can’t open each others files. Software version incompatibility has been a huge challenge for me. On the Toys’R’Us project we had to have extra versions of After Effects to open and save the files in order for another artist to be able to open the file on a different version of the same software. Having an actual studio location would help in many respects. For starters it would speed up the production of our projects. Being able to lean over to the person sitting next to you and ask a question or get approval is much more efficient then sending an email, and waiting for a response. It would also solve some of the other issues I mentioned above. We could control the workstations, and make sure they are all using the same versions of the software. There would be less data transferring, and we could actually store the data on our own servers instead of online storage options. This would all be great, but it would be an additional overhead cost. I would need to make sure the business was bringing in enough projects, and enough income to cover the monthly office expense. Add to this having to buy all the workstations and software licenses, and you can see how quickly it would all add up. It is easy to plan for the challenges you are aware of, but what really scares me are the things I’m not aware of. Running your own company you have to wear many hats, but in no way am I an expert in all these different areas. I try and reach out to others for help when I can, but you know some things will slip through the cracks. Anyone of these unknowns could be what brings down the company. As you can see there is plenty to keep me awake at night, and you might think I’m crazy for taking on all these challenges. Well, I might agree with you, but I also see a lot of opportunities in these challenges. I have to be creative, and look for other ways to overcome the challenges. I’m glad it is not easy, because otherwise everyone would be starting their own animation company. The challenges take out all the people who are not really passionate about this industry. I only hope the challenges do not also take me out.